Attackers in the Bangladeshi capital Dhaka have hacked to death a US-Bangladeshi blogger whose writings on religion angered Islamist hardliners. 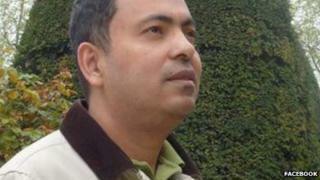 Avijit Roy, an atheist who advocated secularism, was attacked as he walked back from a book fair with his wife, who was also hurt in the attack. No-one has been arrested but police say they are investigating a local Islamist group that praised the killing. Hundreds of people gathered in Dhaka to mourn the blogger's death. Mr Roy's family say he received threats after publishing articles promoting secular views, science and social issues on his Bengali-language blog, Mukto-mona (Free Mind). He defended atheism in a recent Facebook post, calling it a "rational concept to oppose any unscientific and irrational belief". His Mukto-mona website on Friday bore the message in Bengali "we are grieving but we shall overcome" against a black background. US State Department spokeswoman Jen Psaki described it as an assault on Bangladesh's proud tradition of free intellectual and religious speech. A group of men ambushed the couple, who live in the US and were visiting Dhaka only to attend the book festival, as they walked toward a roadside tea stall. At least two of the attackers hit the couple with meat cleavers in the attack on Thursday evening, police chief Sirajul Islam told AP news agency. Dropping their weapons, the attackers ran away, disappearing into the crowds. Police told the BBC they were investigating a local hard-line religious group that had praised the killing in an online message. Ajay Roy, father of the dead man, urged the authorities to find the killers and "ensure exemplary punishment". "This Bangladesh which was built by the blood-sacrifice of the martyrs has now turned into a den of militants," he said. Students, teachers and bloggers gathered at Dhaka University on Friday to protest against the killing. In a forthcoming article to be published in the Free Inquiry magazine of April-May 2015, Mr Roy likens religious extremism to a "highly contagious virus". He says he received threats from Islamist hardliners in Bangladesh last year when his book, The Virus of Faith, was released at a book fair. "The death threats started flowing to my e-mail inbox on a regular basis," he writes. "I suddenly found myself a target of militant Islamists and terrorists. A well-known extremist... openly issued death threats to me through his numerous Facebook entries. "In one widely circulated status, he writes, 'Avijit Roy lives in America and so, it is not possible to kill him right now. But he will be murdered when he comes back.'" The killing in early 2013 of another secular blogger, Ahmed Rajib Haider, which was blamed on religious hardliners, sparked protests from free-speech supporters and counter-protests from Islamists. The police say the attack on Mr Roy was similar to the 2013 murder. Death threats against atheist writers and bloggers are nothing new in Bangladesh. Prominent writer Taslima Nasreen had to leave Bangladesh after she received death threats from hard-line Islamists in the mid-1990s. She wrote on her blog: "Avijit Roy has been killed the way other free thinker writers were killed in Bangladesh. No free thinker is safe in Bangladesh. "Islamic terrorists can do whatever they like. They can kill people with no qualms whatsoever."